The scene of an accident on the M4. The injured occupants were stabilised at the scene and transported to various Durban hospitals for further medical treatment. Five people were injured after three vehicles collided on the M4 near Broadway, Rising Sun Overport reports. Rescue Care paramedics responded to the incident and upon arrival at the scene, found the badly damaged vehicles in the roadway and centre medium. Operations director Garrith Jamieson said two people were entrapped in the wreckage. 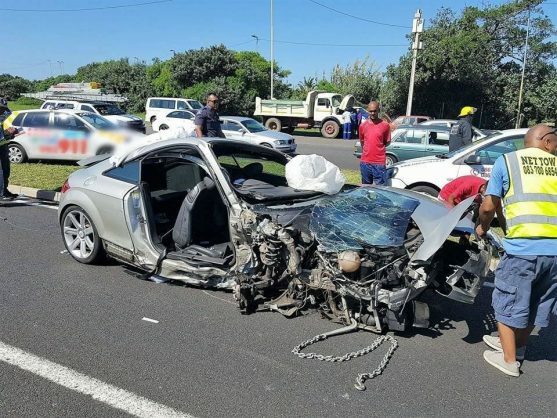 The Jaws of Life were used to free them, while advanced life support paramedics worked to stabilise the occupants in the vehicle. Police were at the scene and will be investigating further.